Greg, without his glasses, already looks like he’s run 10 miles, but really he’s thinking about running 10 miles and wonders if he’ll finish because of his cold and nagging cough. 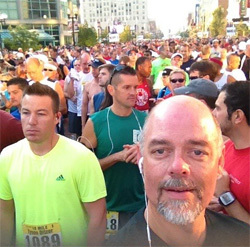 After I ran the Fifth Third Riverbank Run in Grand Rapids, Michigan in May, I needed motivation to continue running. So, I set my sights on the Crim 10 Mile Road Race in Flint, Michigan. I grew up in the Flint area. In 1982 I ran The Crim. At 16 years old, not much of a runner, I ran 10 miles in 1:17, that’s about a 7:40 a mile split. I was 2, 224 place. That was better than half, I guess. That was 30 years ago to the day. Well, I’m not 16 any more. And, I’m probably 50 pounds heavier. But, I competed and I finished! On Saturday, August 25 I was hoping to finish at 90 minutes, or a 9 minute mile pace. Unfortunately, I had a couple of things going against me. 1. I have been battling an upper respiratory infection and my cough has prevented me from training the last 10 days. 2. I’m older, and I had forgotten about all the hills on this course. 3. My will to push on this day was — well — NOT THERE. I started my day with little sleep. My cough from my cold kept me awake. I maybe got five hours of sleep, if that much. An hour here, 90 minutes there, not very restful. I woke up tired, not very excited, and worried whether or not my body would let me run, let alone meet my goal. My dad dropped me off on the U of M, Flint campus and I walked the rest of the way to the starting line. There were surprisingly few people there one hour before the race. I watched the wheelers start, then the 30 year runners, and then it was our turn. I was in wave C, based on the pace I had select when I registered. So, about three minutes after the front runners started, our wave was allowed to start. I actually felt pretty well. My fist quarter mile spit was about 2:15. My first mile was 8:50ish. And, no coughing at all. I made it to mile four and I was still at about a 9 minute pace. Then at mile five I hit a gradual hill. Then, turned a corner and there they were — the dreaded BRADLEY HILLS. This is a section of the race course that has a series of three hills that climb about 100 feet in about three quarters of a mile or less. These hills kicked my tail. When I saw them, my goal was to run up all oft them. I did it! But, I was spent. I got to the top of the last of the three hills and there was another one — a gradual one — but a hill none-the-less — and WATER. The last four miles of the race my body kept saying, STOP, walk a little. So, at each water break I walked through them. It was so frustrating. I had trained all summer to RUN the Crim, not walk it. Not just run it, but do it at 90 minutes. So, how did I do? My official time was 1:41:44. Not what I was hoping for. 11 minutes and 44 seconds slower than I had hoped. But, I did finish and I did my best. Next year, IF I run it again I will do a couple of things differently. 1. I will do more hill training. 2. I will do everything in my power NOT to get a cold. 3. I will conserve a little more for the dreaded Bradley Hills. I will say this, going back to where I grew up was kinda sad. A town that used to call itself, “Buick City” or “Vehicle City” isn’t much of a city anymore. Most of the GM plants have been completely torn down. The home of the famous Sit Down Strike is gone. GM and the Unions have pretty much destroyed a city that was once a bustling city full of hope and pride. Now, the main focus of downtown Flint, colleges and universities. I’m glad I was able to do my part to give this city a boost. If you remember to, pray for the city of Flint. It really needs it. This entry was posted in Family, Health, life, my day, Recreation, travel and tagged 10 miles, Crim, Flint, race by christianradio. Bookmark the permalink.